Western blot analysis of extracts from 293 cells, untreated or UV-treated (50 mJ for 2 hours), using Phospho-53BP1 (Ser25/29) Antibody (upper) or 53BP1 Antibody #4937 (lower). 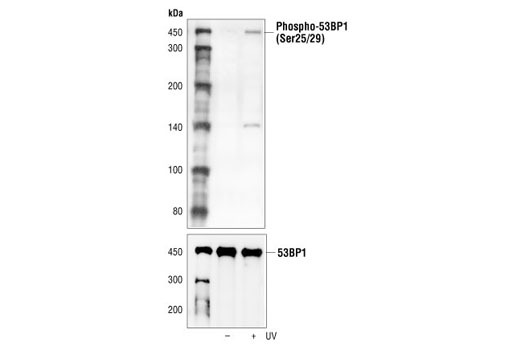 Phospho-53BP1 (Ser25/29) Antibody detects endogenous levels of 53BP1 only when phosphorylated at serine 25/29. Polyclonal antibodies are produced by immunizing animals with a synthetic phosphopeptide corresponding to residues surrounding Ser25/29 of human 53BP1. Antibodies are purified by protein A and peptide affinity chromatography. p53-binding protein 1 (53BP1) was originally identified as a p53 binding partner that could enhance the transcriptional activity of p53 (1,2). 53BP1 consists of two BRCA1 carboxy terminal (BRCT) domains that allow for binding to p53 and a separate domain responsible for binding to phosphorylated histone H2A.X (3). 53BP1 rapidly translocates to nuclear foci following treatment of cells with ionizing radiation (IR) or radiomimetic agents that cause DNA double strand breaks (DSBs) (4,5). Because of this localization to DSBs and homology to the yeast protein Rad9, a role for 53BP1 in DSB repair has been proposed. Recruitment of 53BP1 to sites of DNA damage has been demonstrated to be independent of ATM, NBS1, and DNA-PK (4) and retention of 53BP1 at DNA breaks requires phosphorylated H2A.X (6). In cells lacking 53BP1, phosphorylation of ATM substrates is reduced, suggesting that 53BP1 is upstream of ATM (7). In response to IR, phosphorylation of 53BP1 at serines 6, 25, 29, and 784 by ATM has been demonstrated, but phosphorylation at these sites is not required for localization of 53BP1 to sites of DSBs (6). Phosphorylation of 53BP1 at Ser1618 has been reported to be enriched in human cells arrested in mitosis (8). Iwabuchi, K. et al. (1994) Proc. Natl. Acad. Sci. USA 91, 6098-6102. Iwabuchi, K. et al. (1998) J. Biol. Chem. 273, 26061-26068. Mochan, T.A. et al. (2004) DNA Repair (Amst) 3, 945-952. Schultz, L.B. et al. (2000) J. Cell Biol. 151, 1381-1390. Anderson, L. et al. (2001) Mol. Cell. Biol. 21, 1719-1729. Ward, I.M. et al. (2003) J. Biol. Chem. 278, 19579-19582. DiTullio, R.A. et al. (2002) Nat. Cell Biol. 4, 998-1002. Dephoure, N. et al. (2008) Proc Natl Acad Sci U S A 105, 10762-7.